The use of live animals to lure or decoy bobcats into cage traps has gained recent notoriety, especially in states where the use of other more traditional traps has been banned. But it is not a modern idea. In fact, such traps were used long ago in Europe to catch hawks. A wire basket held a chicken or the like, and a large set of jaws with a perch trigger was located above the cage. When a hawk landed on the perch to get a better look at the chicken, the jaws closed and the hawk met its demise. 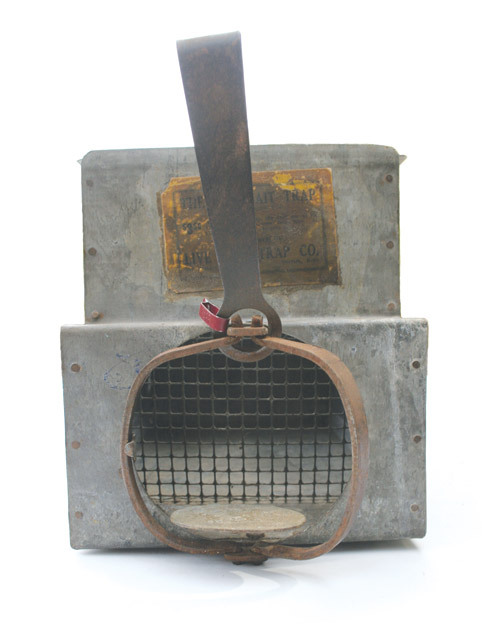 Over the years, a few live decoy traps have been produced for sale in America. My trap is designed for catching swimming fur bearing animals, such as mink, otter, fisher, muskrats, raccoon and others. This trap is set on the bottom of the stream or pond in about one foot of water so that the animal may swim freely over it and the jaws are sufficiently large so that they will snap together and imprison the animal. The screen is so that the fish “bait” can be seen, yet allow adequate water circulation to keep the fish alive. The trap was on the market until 1928 when it was discontinued, most likely due to slow sales. Some of the Harmon traps had jaws with teeth while others were built without the teeth. The pan was very large, and trappers often modified them by cutting down the size. Unfortunately, this hurts the collector value considerably. Complete and in good condition, the trap is worth about $300. 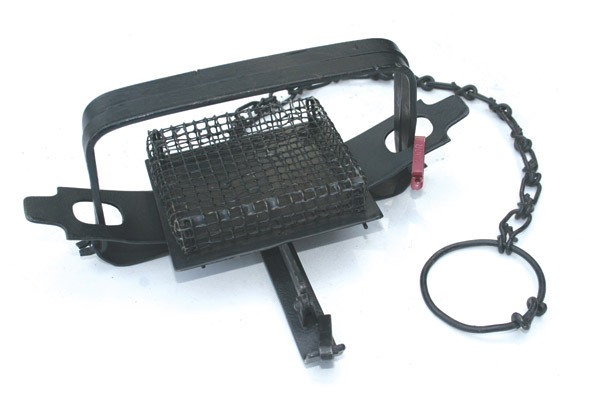 The Live Bait Trap was designed for use on land. It consisted of a metal box with a sliding lid and a screen front so that a predator could see but not get at the bait inside, most likely a chicken. The box dimensions are 13 inches by 8 by 8. Apparently designed to catch mink, it used parts from a No. 1-1/2 single longspring trap and a special design that allowed the jaws to catch a mink by the neck as it stepped on a platform-type trigger to get a better look at the caged chicken. A letter from a trapper in Nebraska to another trapper in Nebraska explains how to make the sliding lid for the trap; it’s postmarked 1980, though the trap itself was probably made years before that. Only two are known to collectors, but I feel others are out there. With only two in collectors’ hands, value is difficult to determine. Because of the rarity, one could be worth as much as $400. I feel certain that other live-bait traps have been made over the years, most being home workbench-type devices. But perhaps a couple of other commercially made devices are still out there, waiting to be discovered by trap collectors.